Well, I doubt I would ever use the word "respect" in proximity of "spammer", but I am at least a tiny bit less turned to growl mode when a spam message shows some originality or cleverness. But stupid attempts at spam comment link insertion are just showing off how low the intelligence factor is among the bottom dwelling roaches, the very bowels of the blog ecosphere. Really? What are the odds of that? As a WordPress user for 5 years, I had no idea! Thank you so much for sharing with me your vast knowledge and expertise. I am so humbled. I must travel to your homeland and learn from the feet of your wisdom. Will you be my mentor????? 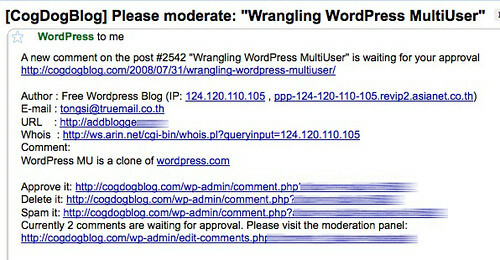 Note to spammers- stupid comments make you much easier to spot your 8 legs and roach stench. SPLAT! goes the heavy metal boot. Mmmm, back in the blogging swing with a good romp around the yard barking at spammers. It always restores energy.